Both the Subaru Forester and Toyota RAV4 are all-new for 2019. Both ride on new platforms, have updated drivetrains, and new interiors and technology by comparison to their last generations. We have just tested the two back to back and by coincidence, they had the same prices. Our 2019 Subaru Forester Limited had an as-tested price including delivery of $ 33,465 and the RAV4 XLE came in at $33,699. It does not get any closer than that! Here is a comparison and contrast for our readers who may be considering one of these two segment favorites. Before we dive deeply into the specifications, let’s talk about first impressions. Outside the Subaru Forester looks very similar to its prior generation. Love it not, the Forester has a distinct look and personality. The Toyota RAV4 has a new one. It now looks a lot like a 4Runner or Highlander, and not much like its outgoing generation. We don’t comment on the looks of vehicles. Your opinion is the only one that matters here. There is not a “better looking” vehicle. That is entirely subjective. Inside, the two have very different vibes. The Forester wows at this price point with full leather interior and heated seats and a heated steering wheel. These features give the Forester a look, and a smell, that in our opinion, tops the RAV4. Add to that a panoramic moonroof compared to RAV4’s smaller one and the first impression inside is that the Forester is the more premium choice. Unless… You are vegan and don’t want leather. That preference is no longer a small minority. Unless… You prefer a small moonroof (we do). The smaller moonroof and strengthening ribs of the RAV4’s roof offer the possibility of roof-top soft travel bag storage. Both our test vehicles has 8” touchscreens. Bravo to both brands for not torturing us with a silly mouse or touchpad to suffer through. Both have in-vehicle WiFi you can pay for. The Subaru has native built-in Nav. The RAV4 offers a temporary trial with Scout, a phone app. The RAV4 offers Apple CarPlay, satisfying a little over half of the population of America. The Forester offers both AppleCarPlay and Android Auto, satisfying all of the population of smartphone users. Advantage Subaru hands down. The Forester offers a passenger volume of 109 cu ft. The RAV4 offers 99 cu ft. Up front, the Forester offers a more panoramic view. It has high side glass and a very large windshield. Both offer good overall comfort. We felt that the RAV4 had a bit more driver’s right knee area. The Cargo area of the RAV4 XLE is 37.5 cubic feet and the Forester offers 35.7 cu ft. However, under the Forester’s cargo floor is additional space that can be used to store emergency items and tools. Both offer a compact spare tire. Our Forester had two features we loved. The first are adaptive, swinging side to side headlights. The second was a heated steering wheel. The RAV4 offers the heated steering wheel, but not the lights. Neither offers a head-up display at this approximate price point. Others, like Mazda’s CX-5, do. Both the RAV4 and Subaru Forester offer outstanding crash protection. Both earn Good scores from IIHS on all crash tests conducted. However, the Forester is an IIHS Top Safety Pick Plus-rated vehicle. The RAV4 does not earn this title, or the secondary title of Top Safety Pick. The reason is the “Marginal” headlights form Toyota. Both have a huge list of safety features and we can’t find any missing. However, Subaru’s lane departure warning never stops squawking. Unless you turn it off. Then it shines a large bright yellow warning light in your eyes. We would trade the lower-rated headlights to get rid of Subaru’s painful lane departure nanny any day. This one is a draw. Do you love CVT transmissions (we do). If so, the Forester has the best one on the market in this segment. That helps the Forester earn a 29 MPG combined rating. The RAV4 has an old-school geared transmission. So if that’s how you swing, you will prefer the RAV4. Both offer non-turbo 4-cylinder engines. The RAV4 has a slight horsepower edge. We didn’t feel it in normal driving. The RAV4 is rated at 28 MPG Combined by the EPA. Toyota’s RAV4 engine has been bulletproof for many generations. The Subaru Foresters has not. The last two Forester generations both had low-incidence, but high consequence engine design flaws. The Forester also had a CVT issue that resulted in an extended warranty in its outgoing generation. 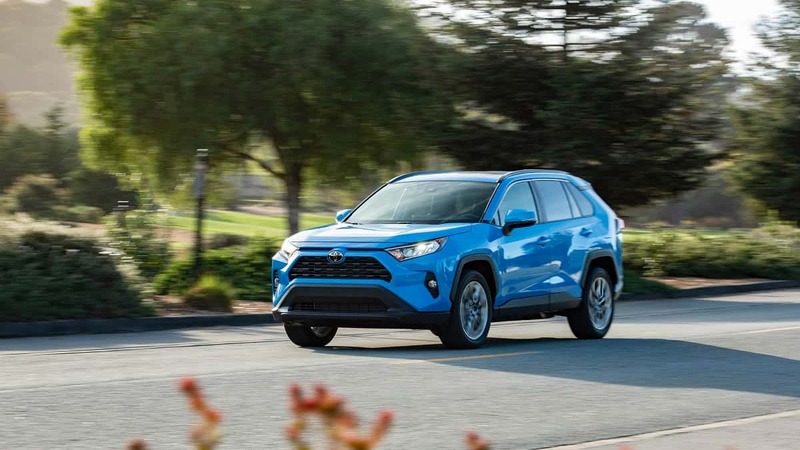 If you are looking ahead at these two first-year of their generation crossovers, consider the Toyota RAV4 the safer bet for long term reliability. Both the Subaru and Toyota in this matchup have identical warranties. The old 3-year 36K mile / 5-year 60K mile standard. However, Toyota offers included scheduled maintenance for 2-years and 25,000 miles. Subaru makes you pay for those services. Both the Subaru Forester and Toyota RAV4 have a lot to offer a shopper with a $33K budget. These two are very close in their overall strengths and really have no major weak areas. Although the Forester has a nicer interior, you have to love leather to appreciate it, and it comes with a massive moonroof whether you want one or not. The Forester has an edge in infotainment. But only if you are team Android. The RAV4 has been more reliable over past generations. There is certainly no loser in this matchup. We have left out the driving part for another focus story. Check our drive report and comparison to see how the $33K RAV4 XLE drives compared to the Forester Limited. Image Note: Interior of RAV4 shown is a higher trim level than the XLE we tested. "The RAV4 has an old-school geared transmission." Actually, it's a hydraulic transmission with a torque converter, and there are many reasons this type of transmission is still used in all high end cars / crossovers / and SUVs. It's worth a premium and deserves it over the band drive CVTs. Your review should have more info on driving, handling, and road manners and less on the soft stuff. Good perspective on the old technology. The link to the drive comparison is in the last paragraph.